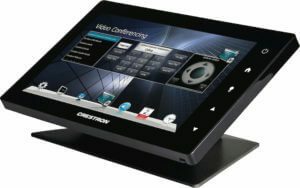 Control Systems provide a simple solution to automating everything in your Boardroom or Home into one integrated system. Via one interface take control of all AV equipment, Lights, Blinds and more. Control systems will simplify the operation of your AV equipment by giving the user one interface rather than multiple equipment remotes. Many control processes occur in the background allowing the users to start meetings without delays and interruptions. Control Systems are custom programmed to our customers’ needs and applications. Touch Screen interfaces are designed for ease of use and corporate identity. Control Systems can analyze energy consumption; turn lights on or off; set actions for when a room is occupied; adjust heating/cooling set points; edit demand response settings and many other useful functions. AVC supplies, installs and maintains professional control system brands like Extron, Crestron, AMX and more.